Jack Schrader gives blood as often as he can and has given more than 14 gallons of blood since 1965, when he was motivated to donate blood by his brother serving in Vietnam. Jack Schrader’s blood has gone into as many as 370 people including, most likely, some who wouldn’t be alive without it. The 74-year-old Manchester resident has given more than 14 gallons of the stuff since his first donation in 1965, when he was motivated to give blood by his brother, Stan, serving in the Army in Vietnam. He said he figured donating blood was the least he could do to give back to the community and repay people like his brother who were fighting for him. Schrader was unable to join the military due to having a medical condition, hydrocephalus. 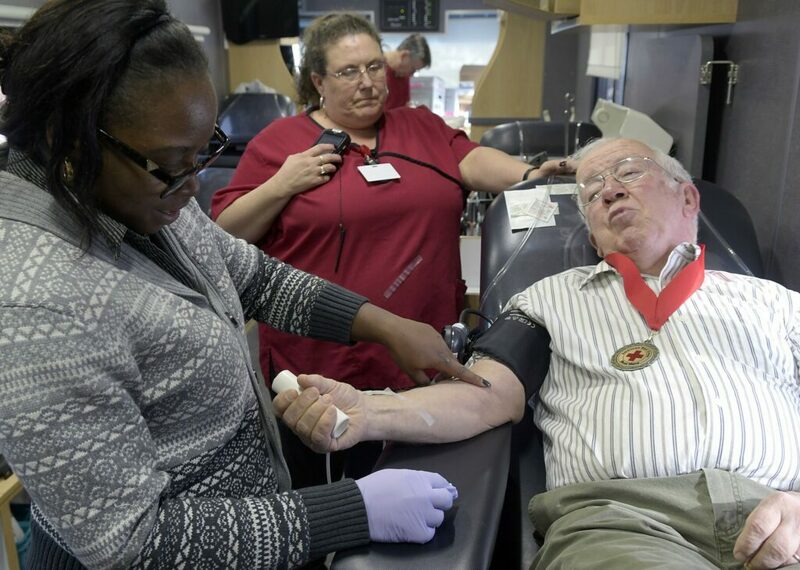 Since then, he’s gone far beyond the “least he could do,” having, since 1965, donated blood more than 123 times. Jack Schrader waits to donate blood on Wednesday in a Red Cross van at the Augusta branch of Kennebec Savings Bank. For donating so much blood, over such a long period of time, Schrader was recently recognized as a “Real Hero” by the Central and Mid Coast Maine Chapter of the American Red Cross, receiving the organization’s Real Heroes Blood Services Award. Mary Brant, communications manager for the American Red Cross Northern New England Region, said one blood donation can help as many as three people, so Schrader’s donations could have helped as many as 370 people over the years. He met two people at the Real Heroes Awards Breakfast earlier this month who both told him his blood donations likely saved their lives. Schrader has given blood consistently over the years, only taking a break, for a year in 2010 or so, after he had heart surgery. 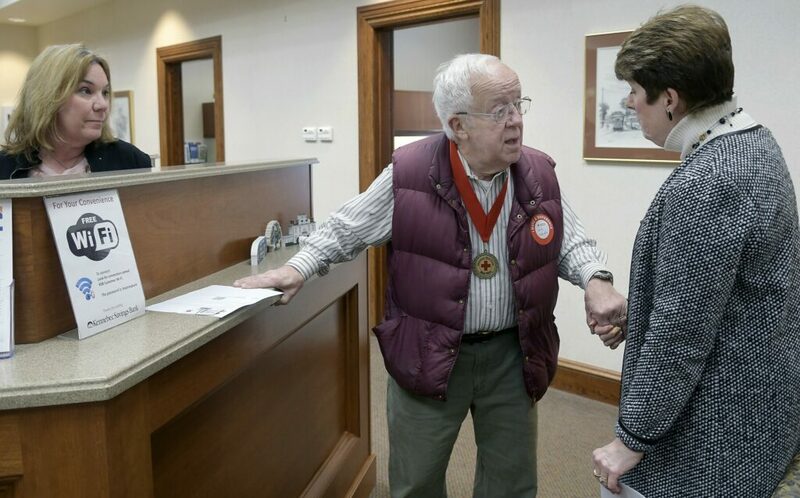 He usually gives blood at employee blood drives at Kennebec Savings Bank in Augusta, where his wife worked for 42 years. Jack Schrader with Kennebec Savings Bank employees Mary Hammond, right, and Mary Ann Smart at the Augusta branch on Wednesday. Schrader always stops in the lobby to visit before donating blood to the Red Cross when the agency visits the bank during drives. The Red Cross has recognized Schrader for the amount of blood he has donated. Brant said giving that much blood, for such a long time, is unusual, and it’s amazing to think about how many people his blood donations have helped. Brant said there is no other source of blood for people who need it other than people who donate it and fewer new donors are giving blood. Every two seconds someone in the United States needs blood, according to the American Red Cross, including people with chronic illnesses, cancer, transplant recipients, patients undergoing surgery and trauma victims. The victim of a single car accident can require as many as 100 pints of blood. 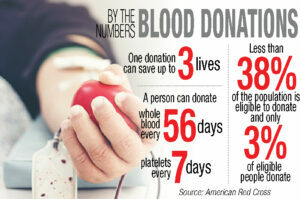 Information on donating blood is available at redcrossblood.org. He said it doesn’t hurt to give, and sometimes he doesn’t even feel the needle prick, which starts the process. Schrader lives with his wife Diane on Pond Road in Manchester in a home the couple built in 1987, on land where Schrader grew up, next to a 25-room home his grandparents ran as a boarding house. He retired after working 18 years at the former Digital plant in Augusta. When he’s not donating blood, he is a ham radio operator, reads, volunteers at the PALS cat shelter in East Winthrop and delivers Meals on Wheels. Schrader was one of nine Mainers recognized with Real Heroes awards by the Red Cross this month.